Los Angeles Kings’ captain Anze Kopitar was the first player from Slovenia to skate in the NHL and the first to win a Stanley Cup as the best ever NHL’er from that small European nation. He’s 31 years old now, but age didn’t affect him last year as he enjoyed his best scoring season ever. I don’t think he suddenly aged overnight or during the offseason but Kopitar, like many of his Kings’ teammates, has been enduring a brutal season so far in 2018/19. Of course, to claim he’s been playing below par we need to compare this campaign to the rest of his career so let’s look back and see just what the center has accomplished up to now during his 12-year stint in the big leagues. The Kings drafted Kopitar 11th overall in 2005 after scouting him in his homeland and while he playing in Sweden. He’s got good size at 6-feet-3-inches tall and 225 lbs and uses it well in both ends of the rink as he’s well known as an excellent two-way player. 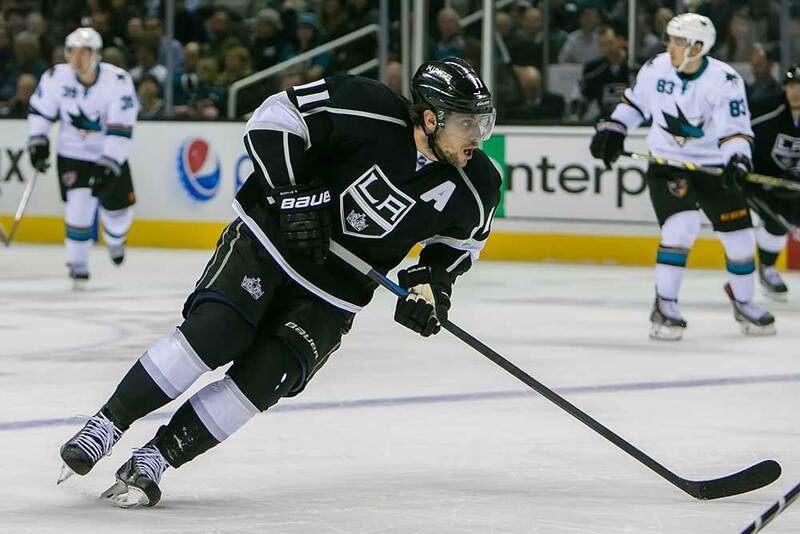 Kopitar played one more year in Sweden after being drafted and the Kings may have regretted their choice as he scored just eight goals and 12 assists in his last European season. They were relieved once he made his way over to LA though as they saw how quickly he was able to adapt to the North American style of game. Kopitar racked up 20 goals and 41 assists in 72 games as a rookie and he’s dipped below that total of 61 points just once during a full NHL season. He did score 42 points in 2012/13, but that was the shortened 48-game campaign. When last season came to an end, Kopitar had 290 goals and 538 assists for 828 points in 922 regular-season games with another 66 points in 79 playoff encounters. He’s also pretty consistent when it comes to games played. Kopitar may not be an iron man, but he’s close to it as he missed just 28 games over his first dozen seasons and managed to play the full 82 contests on six occasions. Over the years Kopitar has led the Kings in scoring 10 of his 12 seasons and he was rewarded with the team’s captaincy prior to the 2016/17 campaign. Dustin Brown was wearing the C at the time and while he wasn’t too happy about relinquishing it there’s been no bad blood between the two players. The Kings have won two Stanley Cups with Kopitar as they hoisted the trophy in 2011/2012 and 2013/14 and he led the league in playoff scoring both times. Actually he co-led the scoring parade with Brown in 2011/12 as they both notched 20 points. Kopitar has also won a few individual awards as he captured the Frank Selke Trophy as the best defensive forward in the NHL in 2015/16 and 2017/18 and the Lady Byng in 2017/18 as the league’s most sportsmanlike player. This saw him become the first Kings’ player to win either of those awards. Basically, all of this background information goes to show just how good Kopitar is and how important he is to the Kings. He suffered his worst season in 2016/17 with just 12 goals and 40 assists for 52 points in 76 games and LA missed the playoffs. However, he then bounced back last season with his best totals ever as he contributed 35 goals and 57 assists for 92 points in 82 contests and led the Kings back to the playoffs. This ranked him tied for seventh overall in league scoring while he was tied for 15th in goals and ranked 13th in assists. This brings us to the current season where Kopitar has managed just six goals and three assists after the Kings’ first 20 games despite playing an average of 22:15 minutes per night along with 3:09 per game on the power-play. At this pace, Kopitar will finish the year with his lowest point total ever in an 82-game season and it’s highly unlikely the Kings will rise from the league basement to make the playoffs. This must be a bit disconcerting for Kings’ management since Kopitar’s making $10 million a year and is playing in just the fourth season of his eight-year deal. Things might not be as bad as they look though as the big center is still on pace to net 25 goals this season. Yes, his assists are down considerably, but Kopitar can’t control what his teammates do with the puck once he’s passed it to them. In fact, he didn’t register his first assist this season until his 10th game. Recently-hired head coach Willie Desjardins has mainly been playing Kopitar between Dustin Brown and Alex Iafallo and Kopitar has responded with a goal in each of his last two games. If the team continues to struggle though we could see Ilya Kovalchuk replace Brown on the top line to help kick start some more offense from both Kopitar and Kovalchuk. There’s no doubt Kopitar and several other Kings are playing well below par this season, but he’s a resilient and proud player, especially now with the C on his sweater. Kopitar’s not going to come close to equaling last year’s numbers, but I’d count on him improving both his play and point production over the remainder of the season.